As I write this 2015 intro, my current abode is situated in the northwest region of the United States, what some folks refer to as the Pacific Northwest due to the western edge that abuts the vast Pacific Ocean. The states of Washington and Oregon are home to the mighty Cascade Range, a long wide mass of mountains in which one volcano after another is clearly visible to people who visit the heavily forested wilderness region. These big fire breathing giants are still alive, some awakening from time to time, sending us humans scurrying for our precious lives. Others are resting quietly in deep slumber, and we build our homes around them because the beauty outshines the perils. A volcano is scenic with snow. The volcano is not the only giant out here however! Rumor has long held that an old species known as Huminoidus Elusivus thrives in the dark woods of the Cascade and Coast Ranges. At seven feet ten inches in height, and weighing in at a staggering 500-1000 pounds, there is a creature roaming the backcountry, which, if it wore shoes, would take a US size 27 if a fully mature male. Of course, this species is wild, thus clothing is not an option. Nor would it be necessary, because the Huminoidus Elusivus mammal is covered totally in thick fur. Imagine a gorilla, only considerably larger, and walking like a human being, rather than on all fours like a gorilla usually walks. This bipedal humanoid, sometimes referred to by the experts as a cryptic simian, is known by several more common names depending upon its Earthly location. In Australia, it is known as the Yowie in the Himalayas, the Yeti, in Mongolia, the Yeren, in Japan, the Hibagon. But where I sleep at night, sometimes in a tent mind you, the species is commonly called either Sasquatch or Bigfoot. In Canada and the United States, the “Bigfoot Field Researchers Organization” maintains all the up-to-date sighting information, and sponsors four-day expeditions for those who are interested in a possible sighting. It is thought that Bigfoot may be a modern-day descendant of this planet’s largest known ape, the prehistoric Gigantopithecus, which is an extinct species that existed between nine million to 100,000 years ago. The Gigantopithecus stood as high as ten feet, and weighed upwards of 1200 pounds, according to fossil records, but since no leg or pelvic bones have yet been discovered, it is uncertain whether the Gigantopithecus walked upright or on all fours like a modern gorilla. Bigfoot, as reported to currently exist here in the Pacific Northwest, is the ultimate creature of stealth, rarely being seen by humans. Science reports that for a species to be as widespread as postulated by Bigfoot enthusiasts, the population necessary for ongoing breeding would need to be sufficiently large as to make the sightings rather commonplace, as one might expect of bears or elk. Generally, due to the current facts, Bigfoot has been relegated to the status of folklore, or blatant hoax in some cases. I have never personally observed one of these Huminoidus Elusivus species, but one night around 2 AM, while tent camping in the forests of southern Oregon on a trike expedition, I could hear an eerie series of distant, yet very loud and distinct, mournful wails that seemed to come from a large animal of some sort. It is difficult to describe because I have never heard vocalizations anywhere remotely close to this. All my life I have hiked and camped in wilderness areas, yet this particular night, alone in my tent, was a first time experience, which kept me awake and listening for about twenty more minutes, while the bizarre sound kept wafting through the dense forest growth. Among some First People of the Pacific Northwest, eerie whistling vocalizations have been reported for many hundreds of years. Visit oregonbigfoot.com or bfro.net for more info. Well, whatever the actual state of absolute reality regarding the Bigfoot controversy, at the very least, studying this online is guaranteed to bring some fun to one’s afternoon. But, you may be asking yourself right about this very second, why have I devoted this introduction to a mammal that may be only a figment of people’s imagination. 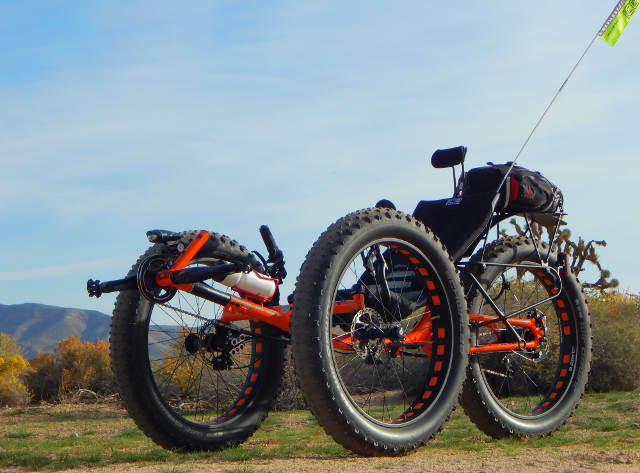 Okay, that’s easy to answer: Bigfoot is my pet name for this rather large fatrike of mine, a connection that you probably understand when contemplating the trike’s big feet (fat tires). 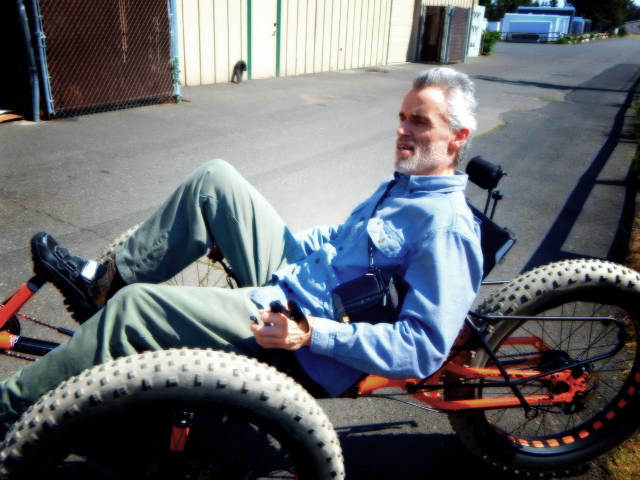 There is also one more concept here: human powered tricycles allow for silent passage, so no one even realizes you just pedaled by. 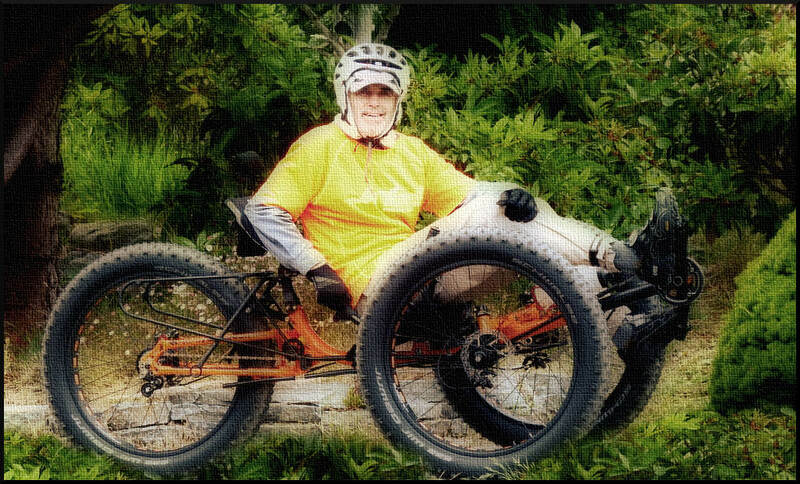 This trike is indeed the ultimate stealth giant, albeit in an inanimate form, compared to a volcano or the large elusive creatures who inhabit the darkest deep reaches of remote Pacific Northwest woodlands. After all, since I currently live right in the thick of genuine Bigfoot territory, and I find the topic quite fascinating regardless of what my reasonable mind tells me, this naming sort of fell into place. 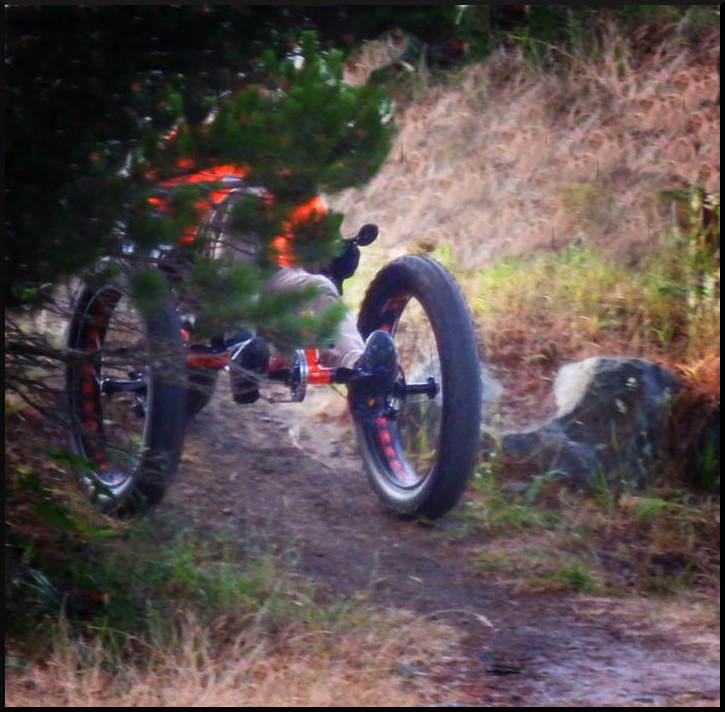 I mean, there is no backwoods vehicle powered by pedals with feet any larger than the ICE Full Fat, so Bigfoot it is! I like the sound of it. I like the fun of it. 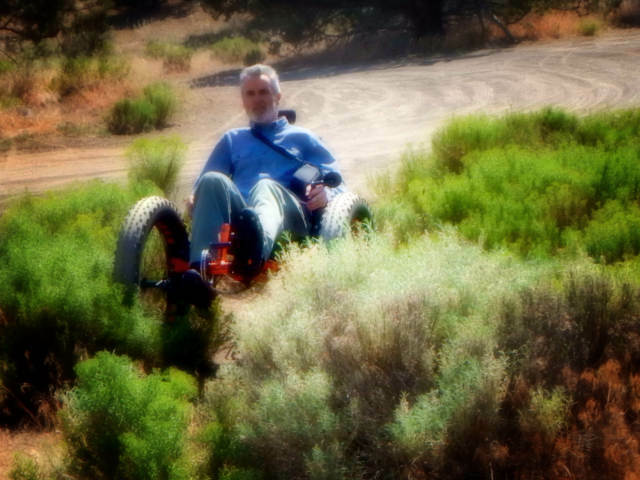 And who knows – since I will be silently riding Bigfoot off into the deep forests of Oregon’s high mountains, a new chance to finally see a real Bigfoot may be in my future. The giants won’t even hear me coming! GO FAT – GO FAR – GO AWAY! 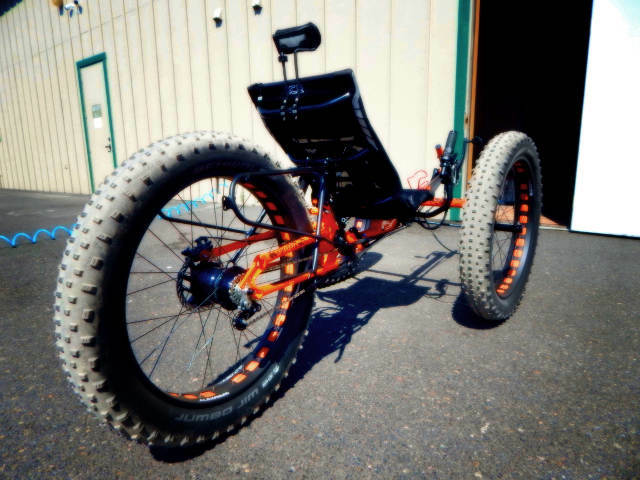 This fatrike is designed to be ridden in the outback, the wilder the better, and it is fully my intent to do so. Of course, out there in the backcountry, there are tire gremlins all over the place, those little obscure items that find their way through the tire’s carcass and into the inner tube. 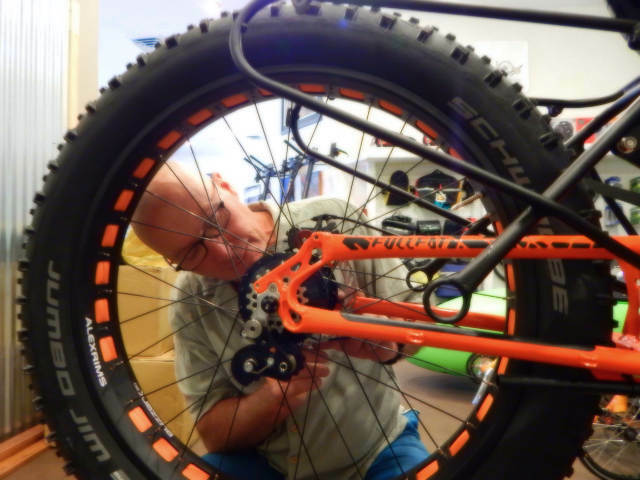 The result is what we know as a flat tire, although a flat inner tube would be more precise. Being that I have never had a flat tire on a trike during my years of riding these fun machines, and being that I prefer to remain flat-free for all my triking days, and knowing full well that the wilds of Planet Earth hold a variety of objects that can puncture a tire and tube, I have chosen to use Mr. Tuffy tire liners to protect all that precious air in the three Schwalbe inner tubes mounted on Bigfoot. I have installed the 4XL size of Mr. Tuffys in all my tires. 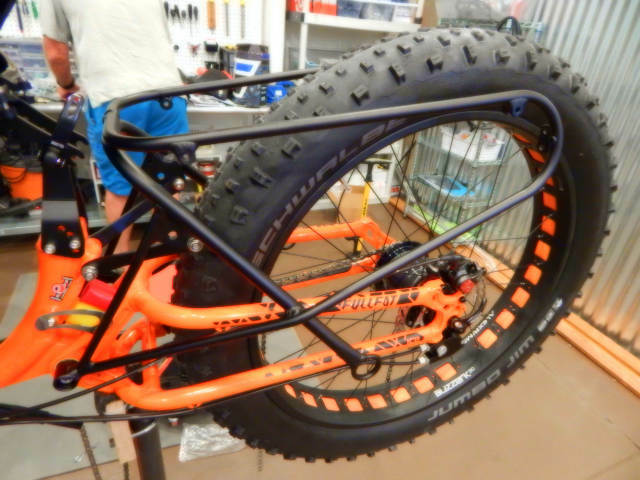 Installing tire liners on this ICE Full Fat is super easy compared to my former ICE Q and Catrike 700, due to the incredible malleability of these monster tires. 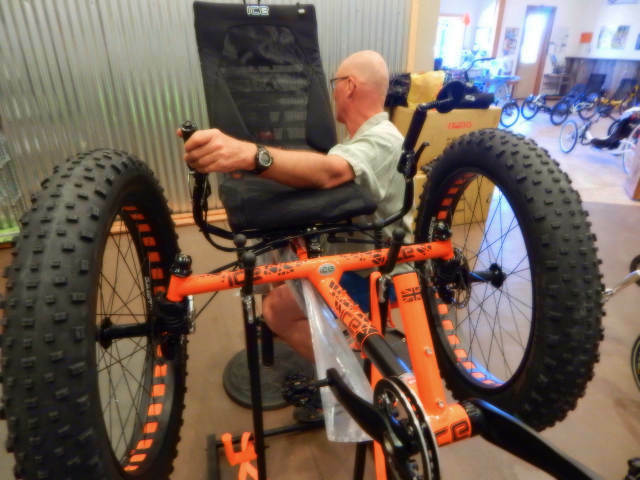 The front two can be installed simply by resting the trike on its side, without even having to remove the wheel from the trike. I did install the rear Mr. Tuffy without removing the wheel as an experiment, but that attempt ended in failure, as I could not get the liner satisfactorily positioned. So, I ended up removing the rear wheel and did the work on the workbench. Here, I have the Topeak floor pump in hand to reinflate the tube. 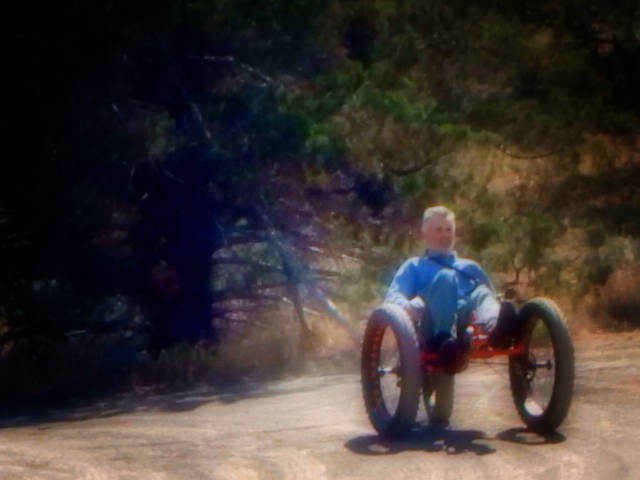 Using two cardboard boxes keeps the hub from being marred on the pavement, and it also stabilizes the trike while working on the upper wheel, tube, and tire. Mr. Tuffy fatrike tire liners are worth their added weight if you don’t like flats! 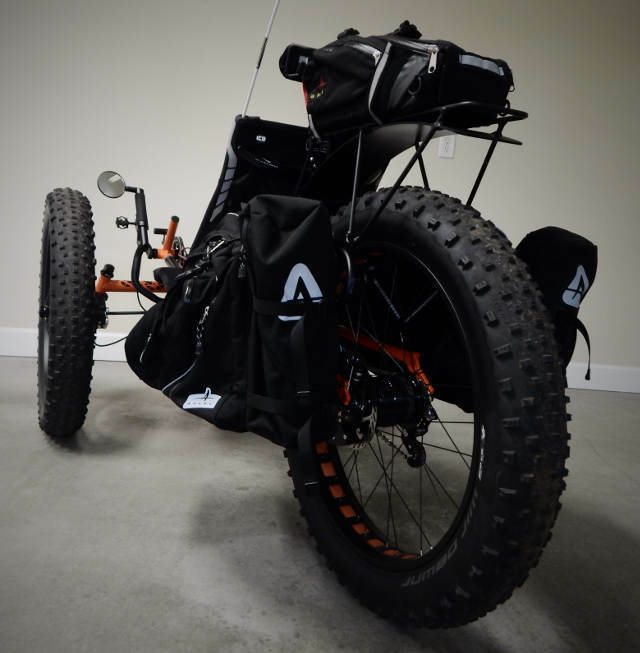 Steve’s custom designed rear fender/rack/pull handle mounts atop the stock ICE pannier rack, and allows his Arkel TailRider top trunk to be easily mounted. 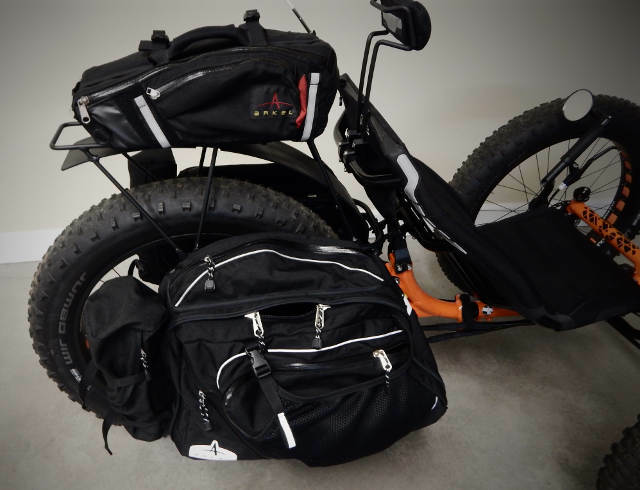 The BEST pannier bags now on board: Arkel TailRider trunk on top, with Arkel RT-60 panniers on each side of the rear wheel. Get the best if you’re an outback explorer! 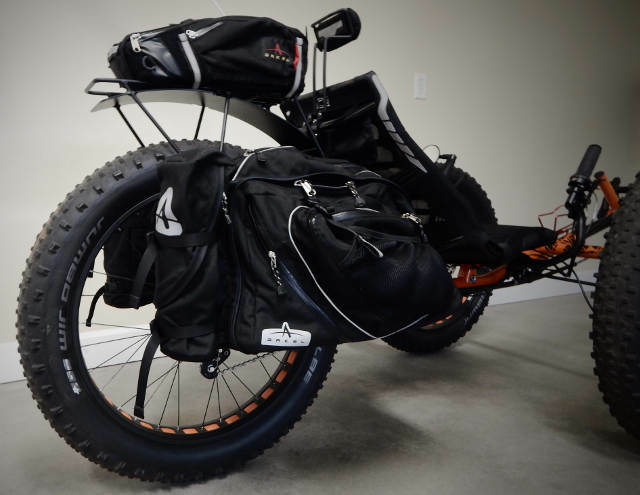 Equipped with panniers – ready for the backcountry – Bigfoot keeps getting bigger! The minimalist pedal is just that … minimal. For me, it was placing too much pressure on my forefoot area when really pushing hard in deep sand. Being so small, the iSSi depressed the sole of my Lake MX-165 MTB shoes, which I have been wearing again because they are better suited for rugged backcountry riding and camping. After about an hour and a half of off road pedaling, including some deep sand, those nasty hot spots were sizzling, as they once did years ago before I figured out how to ride without forefoot pain. I have now removed the iSSi pedals (MSRP: $75), replacing them with Shimano PD-M424 MTB pedals, which provide a relatively large foundation for the shoe. This lessens the pressure delivered to the forefoot by a significant margin. Using my SIDI Dominator 5 MTB shoes, the iSSi is fine, with no pressure problems, due to the SIDI sole, a hard plastic that does not compress under pressure like the Lake MX-165 MTB shoe. The Lake shoe has thick Vibram soles, and they are more compatible for longer riding sessions with the PD-M424 pedals. 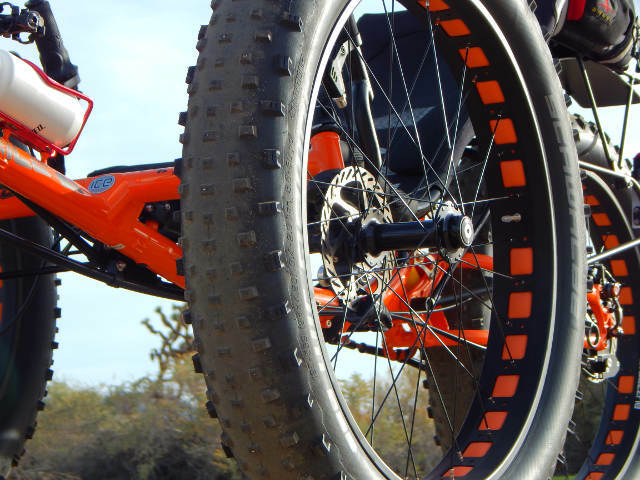 The iSSi pedals come in eight different colors for coordinating with the trike. The Shimano PD-M424 costs $38.75 on Amazon today, and is available HERE. These pedals can also be used with street shoes if necessary, whereas the iSSi cannot. Below are the two MTB shoes I use. The upper shoe is the Lake MX-165 with Vibram sole, the bottom shoe is the SIDI Dominator 5 with hard plastic sole. I used the SIDI shoes on my Pacific Coast ride, and never experienced any issues with hot spots. With the new PD-M424 pedals on Bigfoot, I can use either shoe with comfort, as they spread out the force applied while pedaling in rough terrain. So the ICE fatty won out huh? Looks great. Schlumpf up front and Rohloff on the back? Looking forward to hearing about your adventures on it. You are having way too much fun. Good luck on your adventure I hope it’s all you thought it would be. 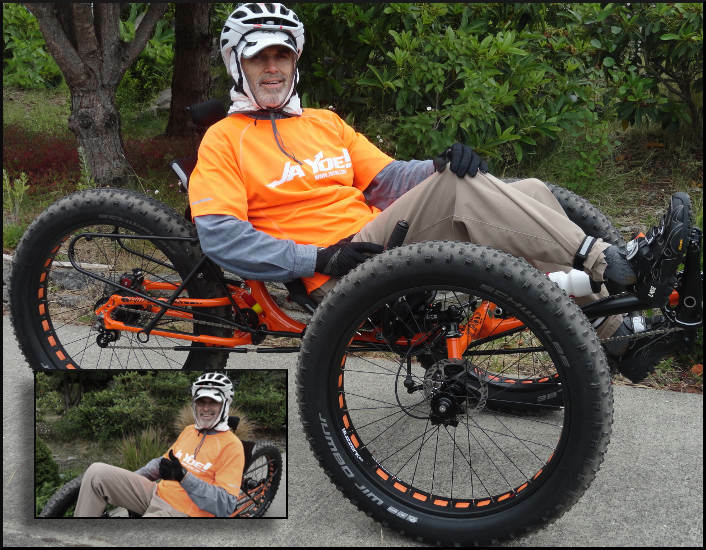 Love your new trike Steve! I’m jealous! I had planed to purchase one months ago but,the need to have dental work done was greater. Ahhhh,the pain! Right now I have a Ice Adventure. I’ve had it for approx. 4+ yrs. It’s off road a lot. Performs excellent for most places. Like you however,I desire more serious locals so as soon as dental is paid in full I will begin saving in Ernest for my Ice! Thrilled yours finally arrived! You are right. Anticipation does make the heart grow fonder! Be safe and have a ton of fun! Please,keep us updated! Yep, I’ll keep ya’ updated plenty, but the news may come in spurts due to my excitement (I now live in the garage on a sleeping bag, right next to Bigfoot – maybe that’s over the top ;-) Regarding your need for leaving the paved insanity of modern autos, I have just the ticket for you, a way forward that you can afford right NOW! And that’s no fooling either! Read Wednesday’s post this week about what Alonzo Savage has done to his ICE T (what is now called the ICE Adventure) – You will get so stoked that you may well wish to follow his lead (quick, easy, cheap, and effective). Your salvation is right around the corner! When I go Zack, let me be pedaling up a backcountry mountain on Bigfoot, roll into a ravine, and enrich the earthen soil with my remains! Thanks for your well wishes! The fun is only starting Jerry! Yep, it’s everything I thought it would be, and WAY more! 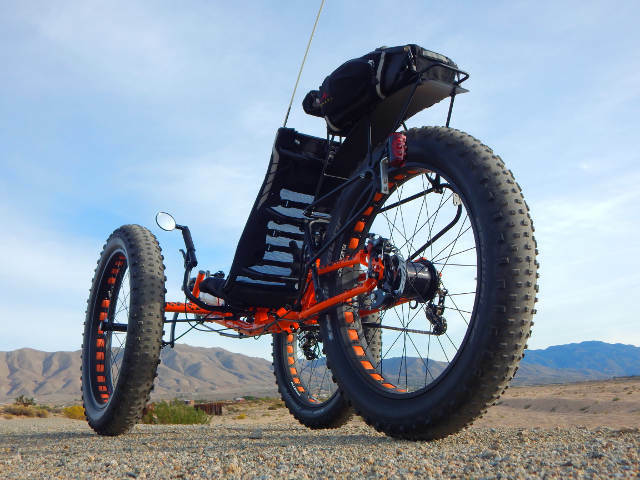 This machine is more suggestive of a human powered Jeep than a tricycle. Man, what a rugged and unbelievable rig it is, impossible to comprehend until seeing one in person, and then riding it. 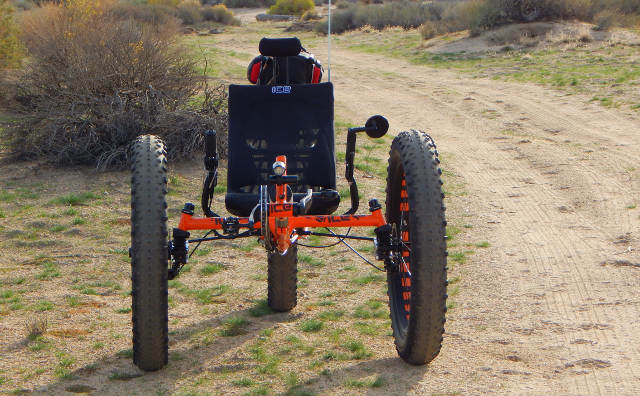 Photos and movies simply do NOT do this sophisticated backcountry vehicle justice. Ya’ gotta’ see it to believe it. And guess what! 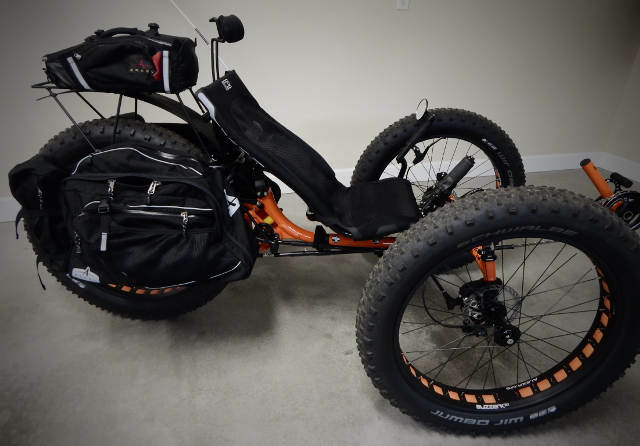 I can pick it up (only 17 pounds heavier than my former Catrike 700). 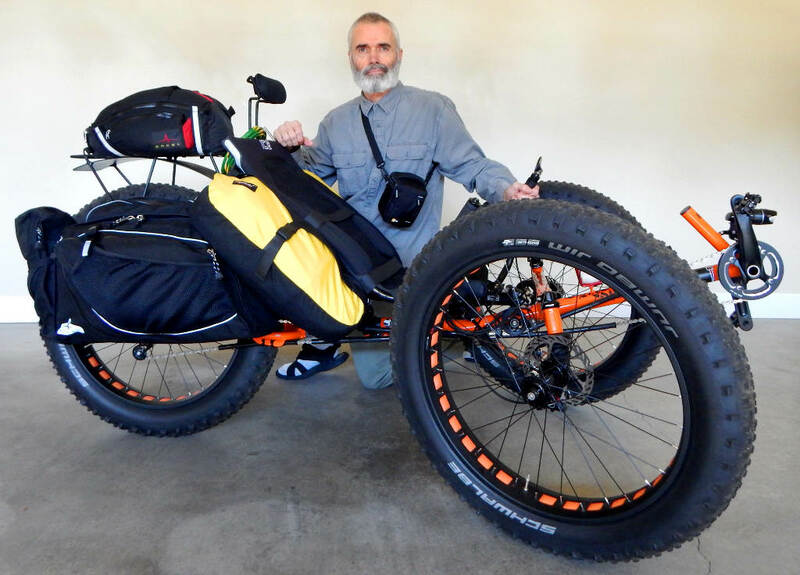 Those huge wheels and tires are lightweight beyond belief too. Ooh, I could go on and on (and I will, so stay tuned to this channel – tons of stuff coming). Rohloff in the rear – a single 34 tooth chainring up front, with no Schlumpf. But the gear range is so gigantic (526%) that I don’t think any more will be necessary. I’ll let you know for sure once I get pedaling up some serious hills. Big adventure planned soon. More later. Curious… At what point do you lose traction in loose gravel or sand? 8 – 10% or greater? 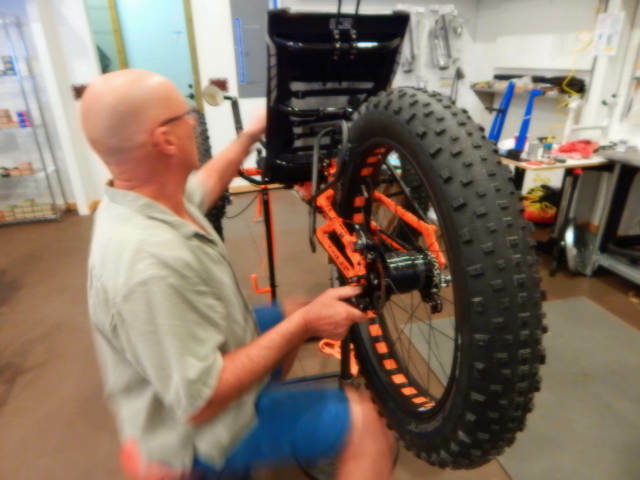 Hi Steve, Bigfoot really looks the part with that rack extension and rear fender, your welder has made a nice job of it. I see you’ve gone for the Arkel R60’s like mine. I’m a little surprised that you didn’t go with the yellow though. Still in the outback your not going to encounter too many myopic motorists. I would be curious to know if Becky ever went the same direction as I have done with my ‘T’. Clearly the plans are coming together for your impending trip. I checked the Arkel website (link below), and although the yellow RT-60 bags are still pictured, the only color choice is now black. This may be a case of demand for black being significantly more than yellow. I think yellow may have been discontinued, so you have a collector’s edition. http://www.arkel-od.com/en/rt-60.html From my perspective, the black looks pretty cool on Steve’s trike, and since he has often spoken of blending in for stealth reasons on his trips, the bags make it easier. I am not sure about your question about Becky. Maybe she will answer. Awesome ride, Steve! Can’t wait to read a full review of your impressions. 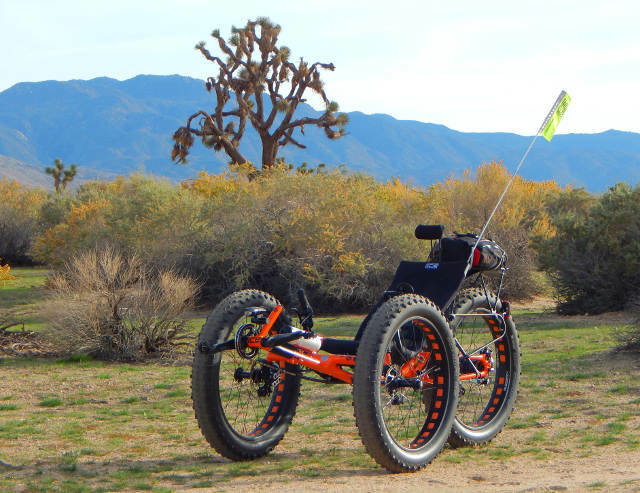 Maybe you’re on your big Death Valley ride now? Looks too much fun. You would absolutely love this trike! It is an awesome and super fun machine that will take you on plenty of adventure! As there does not seem to be a comment section on your for sale post I’llleave one here. 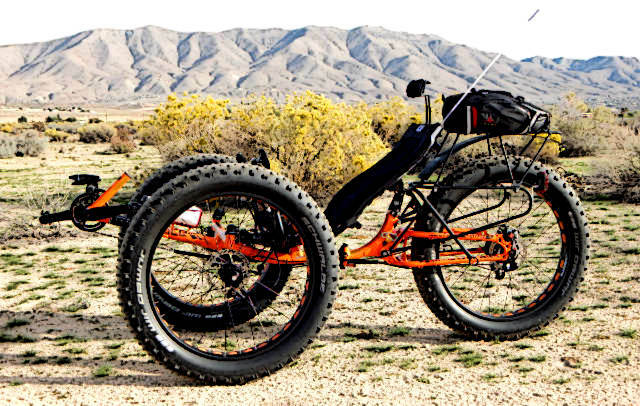 You say you are going to buy ANOTHER fat tire trike after you sell bigfoot. WHY? You are taking a $4500 LOSS by selling for $5000, and then you will spend another $2000 minimum for a new trike. This basically means you would have $3000 in your pocket and be riding around on a $2000 trike that really cost you $6500. 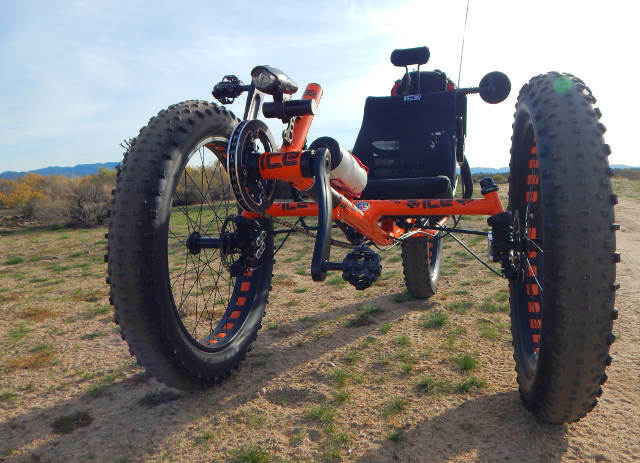 (2000 for new trike plus $4500 loss on bigfoot) Am I missing something here? Yep, you’re missing a key ingredient here. 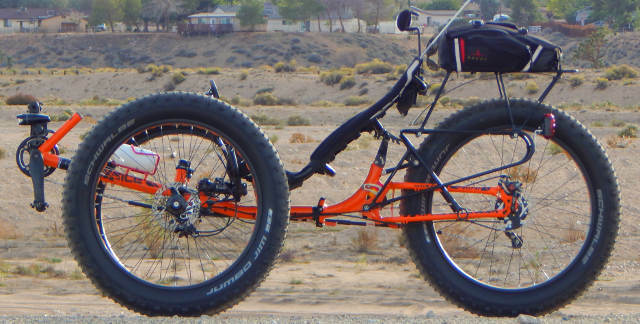 I am transitioning from a fat tire trike to a fat tire bike. 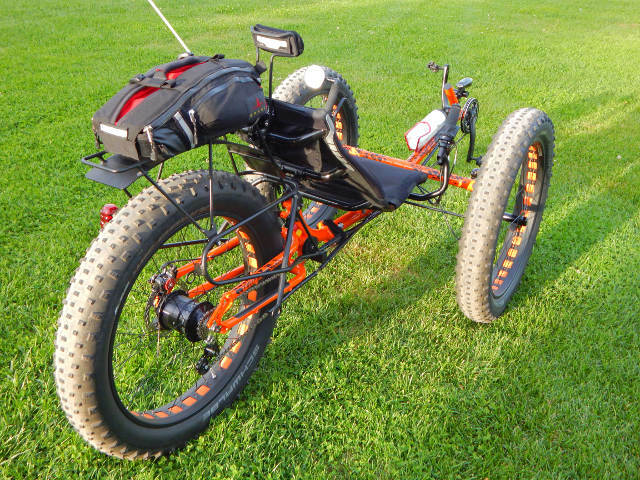 Yes, I would be crazy indeed to sell Bigfoot, only to get another fatrike! 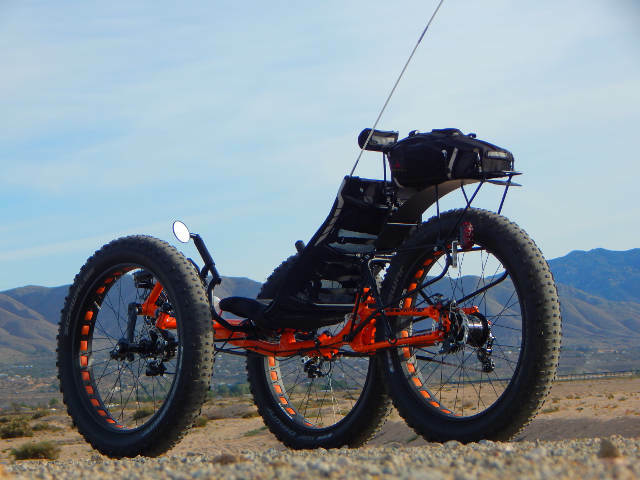 I tell some background about this reasoning on the sale page for the trike.